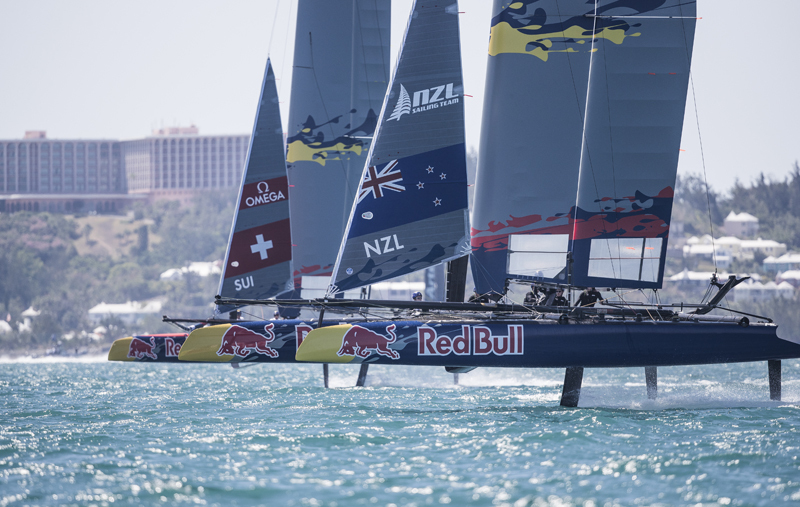 The teams for the Red Bull Youth America’s Cup continue training, with the six teams in Pool B proving that the future of sailing is bright as they mastered their AC45F catamarans on Bermuda’s Great Sound. Despite sometimes wild and windy conditions that were tough even for the senior teams contending in the Louis Vuitton America’s Cup Challenger Playoffs, the 18- to 24-year-olds gave their all, knowing that the youth regatta could be the pathway to their own future participation in the America’s Cup. “It was an exciting and often difficult training period, with very little wind and then at times too much wind,” described Next Generation USA skipper Carson Crain, 23. “We used Monday’s high-wind training to push the team and the boat very hard, ensuring that we are prepared to race in those more extreme conditions. The Pool B teams in Official Training 2 were: Candidate Sailing Team [AUT], Team Tilt [SUI], TeamBDA [BER], Land Rover BAR Academy [GBR], NZL Sailing Team [NZL] and Next Generation USA [USA]. The Red Bull Youth America’s Cup Sport Directors – double Olympic Gold Medalists Roman Hagara and Hans Peter Steinacher – provided hands-on coaching and were appreciative of the teams’ determination. “The AC45Fs are only five feet shorter than the boats in the 35th America’s Cup. Sailing them requires exceptional athletic ability and reaction time from all six team members, even in good conditions,” commented Steinacher. The teams of Pool A – Youth Vikings Denmark [DEN], Team France Jeune [FRA], SVB Team Germany [GER], Kaijin Team Japan [JPN], Spanish Impulse Team [ESP] and Artemis Youth Racing [SWE] – completed their training previously, so with Training 2 concluded on June 10, it’s time for the field to be pared down in the Qualifiers.